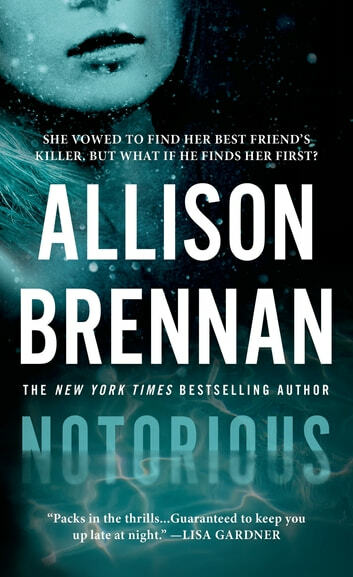 New York Times bestselling author Allison Brennan introduces an irrepressible heroine in her pulse-pounding new thriller Notorious, which Lisa Gardner says is, "Guaranteed to keep you up late at night." 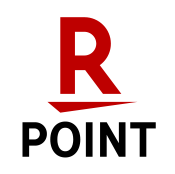 Maxine Revere has dedicated her life to investigating murders that the police have long since given up any hope of solving. A nationally renowned investigative reporter with her own TV show and a tough-as-nails reputation, Max tackles cold cases from across the country and every walk of life. But the one unsolved murder that still haunts her is a case from her own past. When Max was a high school senior, one of her best friends was strangled and another, Kevin O'Neal, accused of the crime. To the disgrace of her wealthy family, Max stood by her friend, until she found out he lied about his alibi. Though his guilt was never proven, their relationship crumbled from the strain of too many secrets. Now Max is home for Kevin's funeral—after years of drug abuse, he committed suicide. She's finally prepared to come to terms with the loss of his friendship, but she's not prepared for Kevin's sister to stubbornly insist that he didn't kill himself. Or for an elderly couple to accost her at the airport, begging her to look into another murder at Max's old high school. Max is more interested in the cold case at her alma mater than in digging around Kevin's troubled life, but she agrees to do both. As Max uncovers dark secrets, she finds herself caught in a complicated web of lies that hit far too close to home. And it's becoming increasingly clear that someone will do whatever it takes to make sure the truth stays buried. I loved this book. This is book 1 in the Max Revere Series. I started this series with book 3 and I loved that one so I went back to read books 1 & 2. 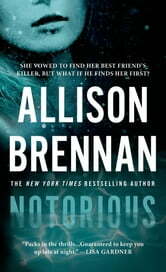 Allison Brennan writes a fantastic mystery with twists and turns with every chapter. Just when you think you might have it figured out there is a blindside with a turn of the page. Max is a hard hitting journalist trying to find the truth, her assistant and bodyguard David is fiercely loyal and frequently frustrated with the risks that Max takes to find the truth. Ben is the producer of Max's TV show on solving true crimes. and is just as frustrated with Max's antics as David but Max always finds the truth which makes for a very successful show. The characters have rich history and are easily relatable. I'm moving on to book 2 - Compulsion. A really, really great new series. Just loved the concept of this book. Excited to read the next book in the series. The story line was completely different from any of Allison's other books. Everyone should give this series a try. Enjoyed this book although I found all the characters and family connections confusing over the first several chapters. The stories of three separate murders and the mystery connecting them creates suspense and evolves into tragedy dating back many years. This is a story dealing with love, loyalty, friendships and human weaknesses. The ending is unexpected and solves many unanswered questions. Loved It! Couldn't put it down. Love Allison Brennan!